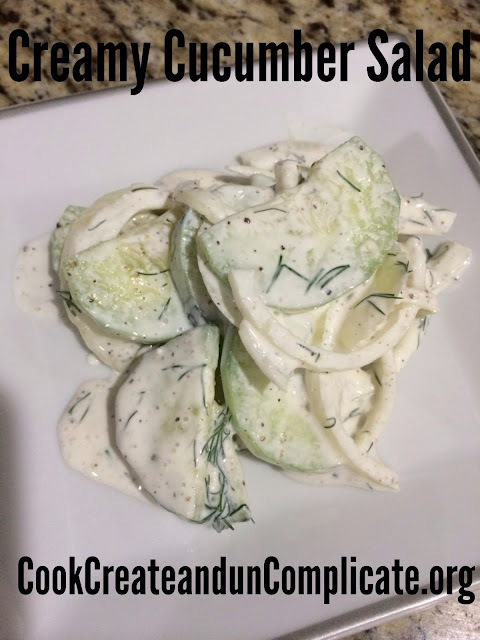 I love a nice cold and creamy cucumbersalad, I make it to change up our normal salad with dinner every night. During the summer months we use fresh cucumbers from the garden, and it really is the best! 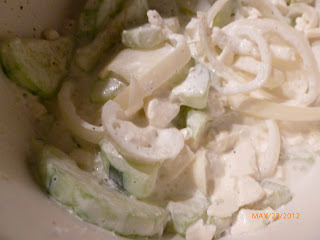 Growing up we didn't add the feta to the recipe, but since feta is Josh's favorite cheese it has been added to my cucumber salad as a new tradition. For this recipe I am using the sweet vidalia onion, since it is in season in early May, and it really is the best onion on earth. Sweet enough to eat raw, it makes a great addition to the salad. If you don't have access to this beauty a red onion will work perfectly. Slice cucumbers and onions and place in large bowl. Pour a couple tablespoons of vinegar over and stir well to coat. Salt and pepper and let sit, stirring occasionally for 10-15 minutes. 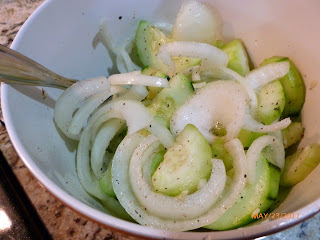 This ensures that the onion gets the raw taste out of it, and adds the zesty pickle flavor to the cucumber. Once the cucumbers/onions have sat and pickled for 10-15 minutes drain off some (about half or so) of the accumulated liquid from the bowl (the salt and vinegar will bring the liquid out of the cucumbers) and stir in the sour cream. Taste and season if necessary, and then stir in the feta cheese. Let entire mixture cool in fridge for 20 minutes or so and serve. * Sometimes if I have it on hand I will add some chopped dill or chives to add a little something to the salad.